Cyanoacrylate, commonly known as superglue, is a one-part adhesive that can form strong bonds with a wider variety of materials than most other types of adhesives. It can join plastics such as ABS, polyester, polycarbonate, PVC and nylon; metals such as zinc, brass, aluminum, permalloys and iron; woods such as maple, balsa, plywood and rosewood; rubbers; and many other materials. In its liquid form, cyanoacrylate consists of monomers of cyanoacrylate: ethyl 2-cyanoacrylate methyl cyanoacrylate, n-butyl cyanoacrylate, and others. Each formulation has different properties to meet end users’ needs. After application, the adhesive cures through anionic addition polymerization: the monomers react to the presence of a weak base and form long chains that join the surfaces together. Moisture in the air initiates this reaction. There are many advantages to a cyanoacrylate adhesives. 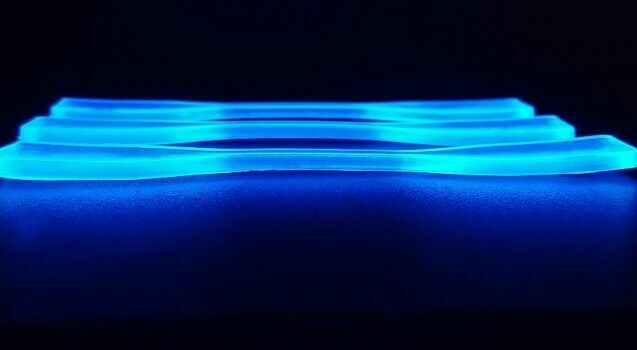 When applied between two surfaces as a thin film, curing takes place rapidly at room temperature, forming a rigid thermoplastic with excellent adhesion to most surfaces. Light handling is possible within seconds at room temperature; the bond is fully cured in 24 hours, with very high strength. The one-component formulation reduces manufacturing costs by eliminating a mixing operation. In addition, cyanoacrylates can easily be stored and transported in bulk since they contain no solvents. There are also two-component products that provide unique properties not available in single component products. A cyanoacrylate adhesive does have a few weaknesses. It’s unsuitable for bridging large gaps or bonding large surfaces in a single application. Standard formulations have relatively low impact resistance, low elasticity, a distinct odor and relatively poor resistance to extended high temperatures. A cyanoacrylate has a limited shelf life after opening, and care must be taking in handling, since it almost instantly bonds to skin. Cyanoacrylates with rubber added offer higher peel strength and impact resistance. Thermally resistant cyanoacrylates offer excellent bond strength retention; in some cases for thousands of hours after exposure to temperatures as high as 121° C.
Surface-insensitive cyanoacrylates offer rapid fixture times and cure speeds on acidic surfaces, such as wood or dichromated metals, which could prolong curing time. Cyanoacrylates are quite effective in bonding small parts that fit well together. They are therefore widely used in the electronics industry and in the assembly of small mechanical components. Cyanoacrylates can bond a wide range of similar and dissimilar substrates, but achieving the best performance requires careful attention to detail. The surfaces to be bonded must be clean, although roughness is not as critical since cyanoacrylate adhesives form strong bonds even on smooth surfaces. The relative humidity is important and should be kept between 40% and 70%. A low relative humidity (less than 30%) increases the setting time; conversely a high relative humidity (greater than 80%) leads to extremely short setting time and causes shock polymerization that leads to shrinking of the adhesive layer, reducing the bond strength.Temperature also influences the time of the chemical reaction. The speed of many chemical reactions doubles for every 10° C increase in temperature, following the Arrhenius equation: for cyanoacrylate adhesives, this corresponds to a halving of the polymerization time. 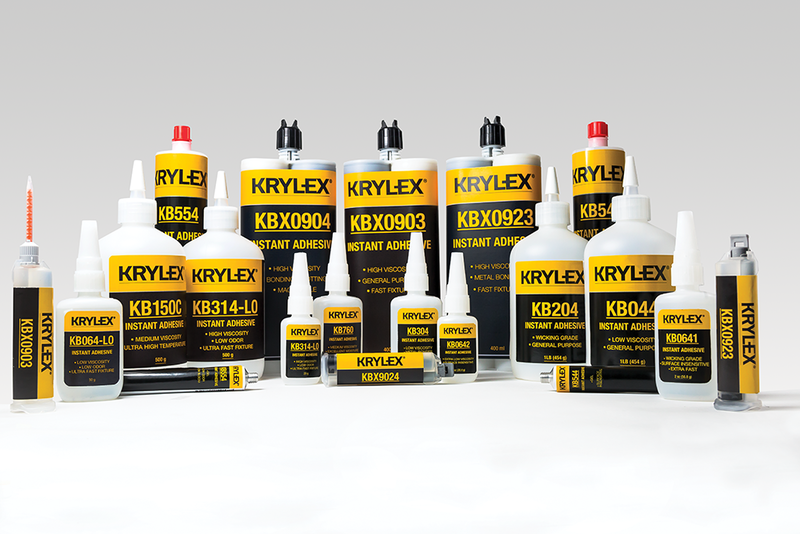 The optimal curing temperature is between 20 and 24° C.
Figure 2 illustrates some of the uses for KRYLEX® products. Chemence® also supplies consumer cyanoacrylates for multiple applications. Glues for DIY and home use are sold under the Dewalt®, Black and Decker® and Craftsman® brand names; liquid bandages are sold under the Liquidskin® brand; and a range of cosmetics cyanoacrylates are sold as fingernail glues and eyelash adhesives. Chemence® has developed well over 150 grades of cyanoacrylates, many under the industrial-grade KRYLEX® brand based on a variety of technologies that include ethyl, methyl, n-propyl, isopropyl, n-butyl, isobutyl and alkoxy-ethyl formulations. The Chemence® product family includes high-purity medical-grade adhesives, high-performance rubber-toughened impact-resistant products, surface-insensitive and high-temperature formulations, and glues with low-odor and low-bloom characteristics.